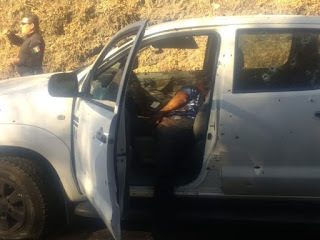 On Monday afternoon at about 15:45 hrs, two men were shot dead in a car on the federal road 134 (Toluca-Ciudad Altamirano) at kilometer 110 in the municipality of Tejupilco. The incident happened near the community of La Fragüita, located some 74 kilometers southwest of Toluca. The victims, who were travelling in a white Toyota truck and reportedly towing another truck (Chevrolet), were assaulted by an unknown number of attackers who took them under heavy fire. Pictures of the cars show particularly the Toyota riddled with dozens of bullet holes. While some reports mentioned a confrontation, authorities indicated that the deceased had no time to react to the attack. Initial reports referring to local security authorities stated that the killed men were active members of the ministerial police. 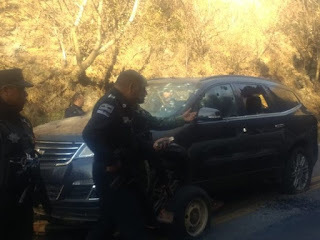 However, the attorney general of the State of Mexico later denied that they are ministerial police forces, claiming that the victims have not been identified so far. The attorney general’s claim that the victims have yet to be identified seems rather inconceivable. First of all due to the fact that local authorities have initially stated the opposite with no obvious incentive to misreport. Furthermore, it is unlikely that the two victims travelled in a car without having any belongings identifying themselves with them. There is another factor to this story which is making the assumption that the victims were actually ministerial police officers (or at least posing as such) very plausible. In recent time, several aggressions against ministerial police forces have been reported in and around Tejupilco. On Thursday, the 24th of January, three ministerial police officers were seriously wounded in an armed confrontation in San Sebastián Carboneras, situated just about 22 kilometers northeast of Tejupilco. It appears possible that this was triggered by an incident happening a day earlier. On the 23rd of January, 312 kilograms of marijuana were confiscated by security forces in a truck on federal road 134 (Toluca-Ciudad Altamirano) within the municipality of Tejupilco. In October 2018, another violent encounter took place between criminals and ministerial police forces, leaving one of the former injured. This incident last year happened as well on federal road 134 and also in San Sebastián Carboneras. However, the most prominent violent incident in the region in recent time took place in October 2018. Back then, four state police officers were killed in an ambush in Almoloya de Alquisiras, located about 28 kilometers east of Tejupilco. 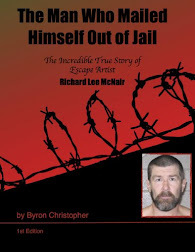 The reason that it even made international headlines was a video appearing in December showing presumed La Familia Michoacana sicarios filming themselves before the assault as well as filming the actual ambush. Inevitably, this suggests the assumption that La Familia Michoacana members have also been behind the above-mentioned series of assaults on ministerial police officers. This assumption was implicitly confirmed by several narcomantas appearing in Tejupilco on Tuesday just a day after the latest deadly attack. In the narcomantas (which unlike most other recent narcomantas look quite professional), La Familia Michoacana threatens and announces actions against state police and ministeriales (explicitly mentioning prosecutor Adolfo Eloy Peralta Martínez and another official named Francisco Carreon Garcia). In addition to that, they accuse them of terrorizing the population of the southern region of the State of Mexico. Paradoxically, they specifically mention the Army and the Marinas, expressing their great respect for them in the narcomantas. This is most probably owed to their hope that they do not interfere alongside with state and ministerial forces given they could not stand their ground against a combined effort. Nevertheless, all these recent violent events (and particularly the high number of subsequent casualties among security forces), the group’s obviously relatively strong firepower, as well as their elaborate narcomantas, lead to the assumption that this specific La Familia Michoacana cell is both relatively sophisticated and comparatively strong in the region. In consequence, further skirmishes in Tejupilco and the surrounding region as well as along federal road 134 have to be expected. 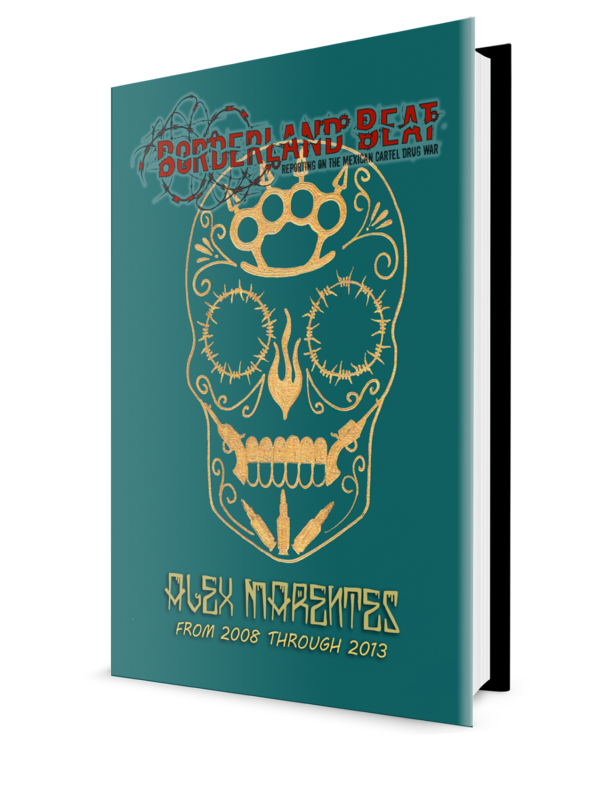 What is the new president of Mexico doing about rampant homicides,Nada! What are you doing for a better Mexico???? The people must change !!!! Curious as to what you are doing? How many good decent people have gotten killed spreading peace and love in Mexico? Besides these municipal officers like government officials are the root of the problem. Time for citizens to take action by shooting these low lifes already. Oops forgot that the humbleness of these good folks will not permit them to do so. And that's why Mexico is where it's at now. Nothing can be done until someone controls the corruption. This will happen in 2250 if mexico is lucky..
You think change is the goal? You are blind my friend. Love your analysis on most of your articles Oaxaqueno! La Familia Michoacana and the Municipal police are in dispute over who controls that region of the state of Mexico. They placed a manta against El Yanky a man well know to many in Mexico and his collusion with organized crime and organized corruption in Mexico who is also a former or current commander of AFI.